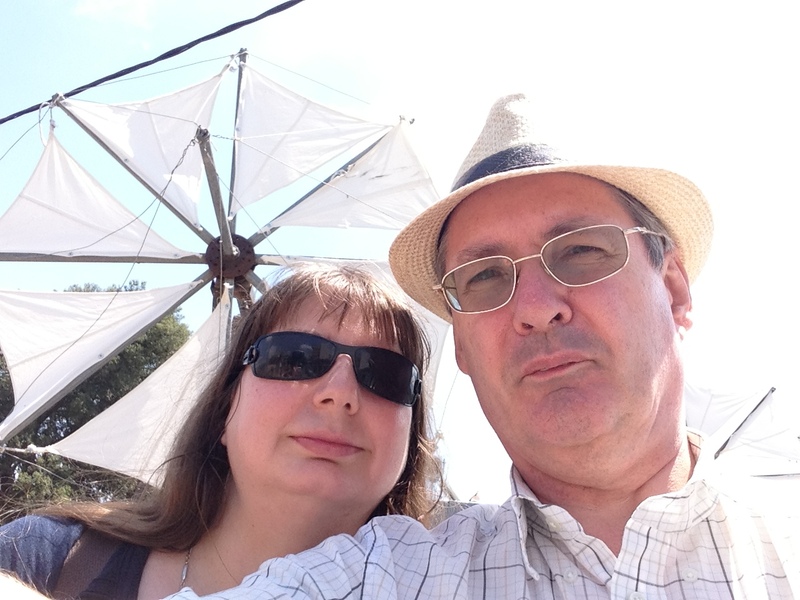 In August 2013 we spent a week in Crete thanks to the free holiday we had won. We received a week's accommodation in the Village Heights Golf Resort in Hersonissos. The resort is located in the foothills quite a distance from the busy tourist area along Hersonissos beach. It was a quiet location, but we didn't feel too isolated as there was a shuttle bus into the village (and back) a few times a day. Our apartment contained a living room, dining area, balcony, small but very well-equipped kitchen, bedroom, and bathroom. It was comfortable and spacious, and the furniture was full-sized, without the compromises seen in some hotels, though as in most hotel rooms the lighting was somewhat insufficient. We had breakfast and a couple of dinners in the poolside restaurant, and the rest of our meals in cafes or tavernas while we were out, or prepared in the kitchen. We visited Heraklion, where we have been a few times before. We returned to the Archaeological Museum, which has been renovated since our last visit. However, the air conditioning was not being used, presumably for budget reasons, so it was rather hot. We saw various finds, ranging from Minoan to Byzantine. I recommend this museum to any visitors to Crete. We had lunch in a cafe in the pedestrianized shopping area, and while we were eating an accordion band walked by playing some sort of folk song. Then we went down the the Venetian harbour and spent a while trying to photograph the impressive waves, while preventing our sunhats from being blown away. We also visited Agios Nikolaos, a touristy but still charming coastal town with a lake. That day started out cloudy and overcast, and there was even a bit of drizzle in the morning, which made a pleasant change from the normal summer weather. We walked around the lake, did some souvenir shopping, and had lunch in a taverna where we fed some cats. Another day we went on a guided tour to the Lassithi Plateau and Knossos. I enjoyed the drive through the mountains, where we saw wild goats and eagles. First we visited the monastery at Kera. Then we visited the Cave of Zeus, but after climbing up the hill we saw the long queue waiting to enter the cave, so we decided not to bother and returned to where the bus was parked and had a drink and looked around the souvenir shops. We were taken to a potter's workshop to see a demonstration of pottery making. 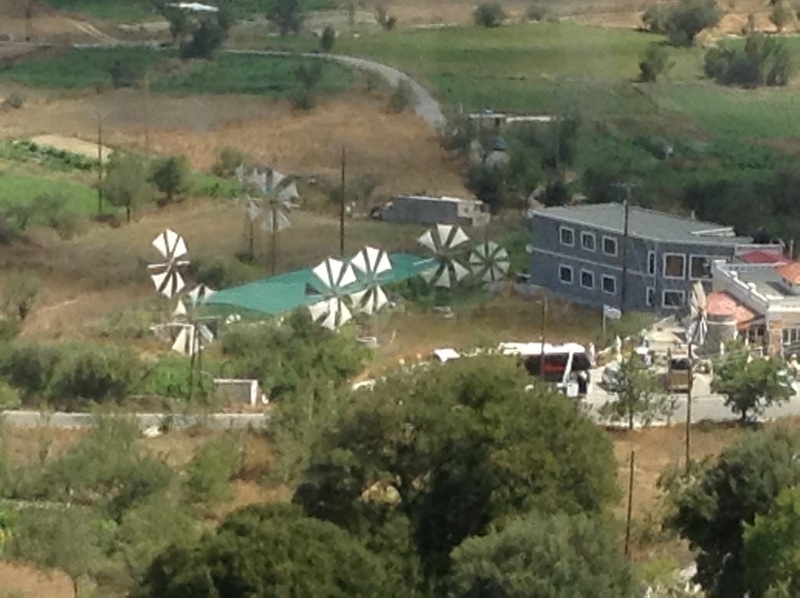 Then we had lunch in a taverna with windmills in its garden. 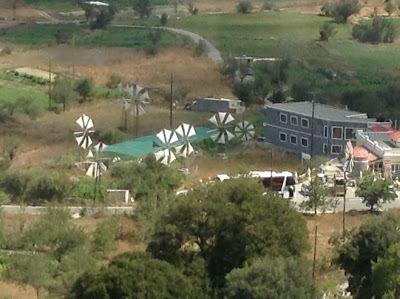 These windmills were the traditional way of pumping water from the aquifer all over the Lasithi plateau, but there are not many of them left now. After lunch we were taken to Knossos, the Minoan palace, which we had visited before. The first time we were there we saw peacocks living on the site, but they don't seem to be there any more. It was hot and quite crowded, and we wandered around on our own instead of staying with the group. It was good to see the site again. We also went for a walk in the local villages not far from the hotel. We visited Old Hersonissos, Piskopiano, and Koutouloufari. These villages are in the foothills above the busy coastal area. We enjoyed seeing a more authentic view of Cretan life. In Piskopiano we visited the Museum of Rural life, which contained a collection of artifacts related to farming and village home life, and also an impressive collection of traditional Cretan weaving and embroidery. We had lunch in Piskopiano and then walked downhill to the touristy seafront of Hersonissos. We enjoyed our holiday, and found a balance between wanting to go out and see things, and also needing to rest and enjoy some quiet times in the hotel. Crete provides something for everyone. The locals are friendly, the food is excellent, the public transport is reasonably reliable, and we were fortunate to be staying in a hotel more luxurious than usual. What a great holiday! I have been to most of these places and you returned me back 15 years ago!AriadnefromGreece!